Sometimes it can be hard to find a running light that’s right for you. Many people end up buying various types of running lights and end up choosing the one that feels proper to them. However, purchasing multiple running lights can prove expensive. If you’re in need of a running light, it’s best that you learn about the numerous kinds of running lights, and thus make an educated decision based off your knowledge about how a specific light can further improve your performance. What are the advantages to using a running light? Running at night can pose some disadvantages, however running with a light of some kind can profoundly enhance a person’s performance. In fact, some lights can illuminate the path ahead of the runner. Brightening a runner’s course is crucial in averting injuries and preventing unnecessary accidents from occurring. Although, not only does a light allow a person to see but it alerts others around to a person’s presence. While running lights might not be useful for people who exercise during daytime hours or like to go to the gym to run, however, running lights are a valuable product to the people that need them. Due to the diversity of running lights, the product can be placed in various places on a person’s body in order to maximize light and hands-free capability. Therefore, a running light helps a person stay safe as well as improves a person’s workout. 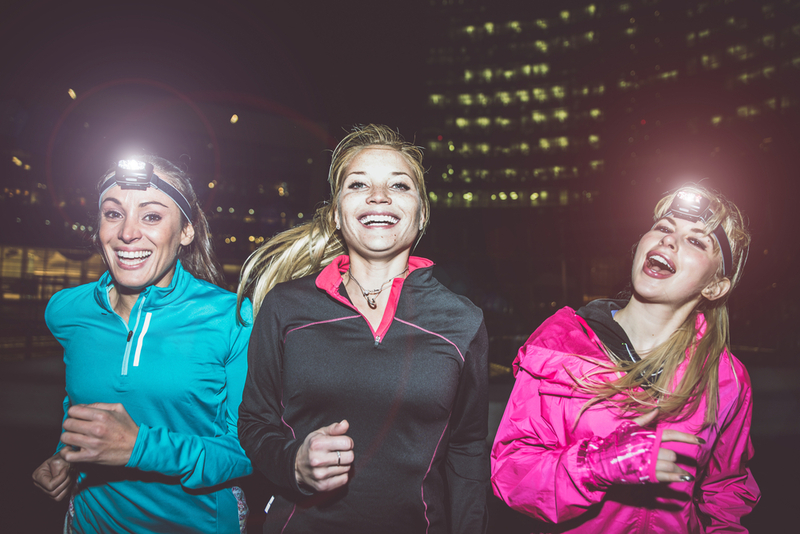 Headlamps are known to be a runner’s best friend. Due to its hands-free capability as well as illuminating the path in front of the runner, headlamps are the best illustration of running lights. In fact, since the light’s movement changes with your head, you’ll see anything that catches your eye. However, some people are cautious about purchasing a headlamp since depending on the darkness people from behind may not see you, and thus there is a chance of accidents occurring because of the absence of light. Also, headlamps are known not to be long distance lights. Some people dislike only knowing what is ahead of them for a few steps, although, headlamps continue to be an easy-to-use running light that’s a cost-effective product. Therefore, while headlamps might have a few challenges, they’re widely accepted as successful. Most people have several flashlights within their home or apartment for emergencies. However, a flashlight can be used as a running light too. 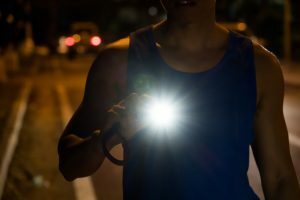 In fact, people who use flashlights as running lights have found that they can detect what is around them more clearly than any other type of running light. In addition, using a flashlight as a running light enables you to have extreme mobility over the light. However, flashlights perhaps are not the best running light. Many people dislike the amount of light the flashlight emits as well as it’s not hands-free. 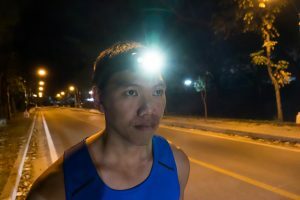 These qualities of the flashlight pose some challenges to runners in which can provoke injuries, although, if you’re in a bind using a flashlight as running light is a cheap and a practical solution. Most people don’t typically buy chest lights not because they’re not of good quality but because they’re expensive. In fact, chest lights provide many features that would aid a lot of people like various modes of flashing lights, hands-free capability, and even light appearing from behind, but some people believe it’s not worth the cost. While it’s true that chest lights can be uncomfortable for some runners, however, chest lights are known to be versatile for all people. The one drawback to this high-tech product is that runners are unable to see what lies ahead. A lot of people dislike the thought of not knowing what they’ll be running into and select another light. Some people decide to illuminate their path with shoe lights, although shoe lights aren’t the most effective light source out there. While it’s true that shoe lights are hands-free and display a runner’s course on the ground level, however, shoe lights offer many challenges. For example, most people who use shoe lights don’t have a clear display of the course from eye level; thus, injuries and accidents can occur quickly. Also, shoe lights prohibit others from seeing a person from behind. But the scariest challenge of these lights is that they’re known to rip off during a workout. Therefore, while shoe lights offer a small light source, it might be best to select a different product. Many people know armbands for its silly colors and flashing lights. However, armbands are not just used in a party scene in fact armbands are a necessary running light. Unlike other products, with armbands, you can use multiple bands to display brightness and further emit your presence. In fact, many people like armbands not only for its hands-free capability but also because people can see you from behind. However, not all people like armbands as running lights. Due to its band, armbands limit light mobility as well as produce a smaller release of light than other running lights. But all in all, armbands work to improve a person’s performance by allowing light to emit from around a person’s arm. Knuckle lights are most compact of all the lights. While they’re lightweight and feature hands-free capability, some people find flaws with its design. It’s true that knuckle lights are easy-to-use; however, they’re known to be uncomfortable. In fact, one of the major complicates about the light itself is that its placement feels unpleasant. Even the light that emits is not directed at the path ahead but instead at the runner’s feet. Some people dislike not knowing what lies ahead, although, while knuckle lights present some challenges they’re known to be cost-effective. Therefore, while knuckle lights might not be the best choice, they’re a low-priced and effective option.